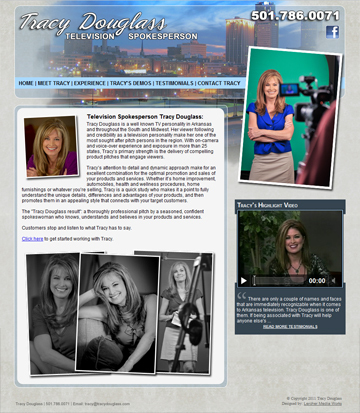 LMW designed and built Tracy Douglass, a TV personality in Arkansas and throughout the South and Midwest, website to showcase herself to potential clients. Primarily based in Arkansas, we used the Little Rock�s sky line as a background element. This created nice color shades that enhanced the blue overlay elements and gave them the appearance of looking like glass. The three pictures in the bottom left of the home page, as well as on other pages, rotate to show a ton of other profile pictures of Tracy Douglass. The right column always has another profile picture and under it includes her demo reel. After we launched Tracy�s website, she wrote us "You guys have been AWESOME! You have delivered so much more than I ever expected. If you want professionalism, impeccable customer service and the best website...contact them! Just wanted to say thank you again for everything! You really have been wonderful and have gone above and beyond working with me. I doubt very seriously any other company would have been so patient, professional and caring about my project! And you can print that! :-) I will always sing Lercher Media Works praises as if it were my own company!"